Bengal tigers are nocturnal: they hunt at night. Though powerful and quick over short distances, they stalk their prey because they cannot outrun faster prey. The Bengal tiger kills small prey with a bite on the back of the neck and large prey with a bite to the throat. 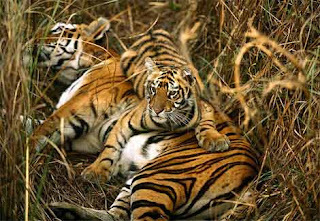 Bengal Tigers mainly hunt gaur (wild ox) and buffalo. Although a tiger is capable of killing a bull gaur more than twice its size, it prefers to attack young or old animals that put up less resistance. In the Sundarbans region of India and Bangladesh, the tiger's prey are chital (axis deer), wild boar, and monkeys. Bengal Tigers will sometimes attack porcupines.